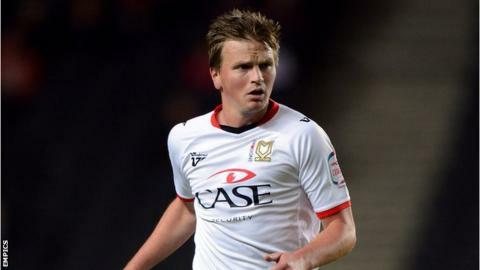 Coventry remain without a home league win this season after Stephen Gleeson's equaliser earned MK Dons a point. Carl Baker and David McGoldrick forced early saves from Dons keeper David Martin before Richard Wood headed the hosts ahead from Gary McSheffrey's corner on 34 minutes. But Gleeson's deflected effort levelled as it wrong-footed keeper Joe Murphy. Charlie MacDonald and Luke Chadwick nearly grabbed a winner for the Dons, but the ball was scrambled clear. "They're a really good side who put us under the cosh at times. But the lads have to get some credit as, a few weeks ago, we'd have lost that. "I was happy with how we started. Those opening stages were really impressive. Hopefully we can do that for the entire 90 minutes in the future. "We did seem to fade towards the end of the first half. But I'm delighted that we stuck at it and, towards the end, we had a few chances to win it. "They've given everything they've got and it was great to see Cyrus Christie and Nathan Cameron back. They haven't had much match practice but they've come in and done well." "I thought Coventry started off really well and caused us big problems. "But, without being disrespectful, I thought we were far the better team. "We deserved three points and created enough chances to win four more matches and didn't take them. "It's criminal that we conceded from a set-piece. But, from then on, I thought we were magnificent."